Greedy Girl doesn’t want to meet individuals who aren’t utterly captivated by pandas. These gigantic black and white fur balls are adorable. Lazy, rotund, bamboo-eating machines – but adorable. On our recent sojourn, we headed for the Giant Panda Sanctuary about an hour’s drive from the city of Chengdu – capital of China’s Sichuan province. It’s only around 10km from the city but traffic pretty much anywhere in built up areas in China is crazy and particularly so in the mornings. To give the sanctuary its full title, it’s the Chengdu Research Base of Giant Panda Breeding. 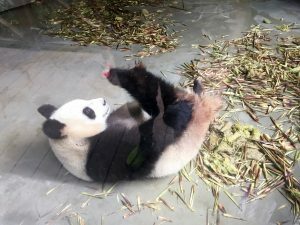 There are two major facilities for pandas in Chengdu. This is closest to the city, while the Dujiangyang panda base is about two hours’ drive. 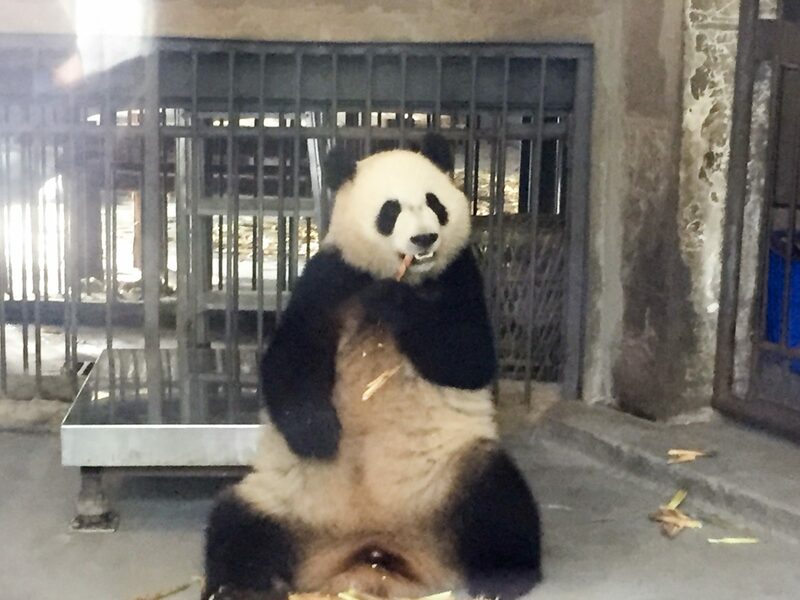 Chengdu is also home to one of China’s spiciest cuisines, but the giant pandas, nearly wiped out in the wild with an estimated 2000 remaining, prefer a rather different foodstuff – bamboo. 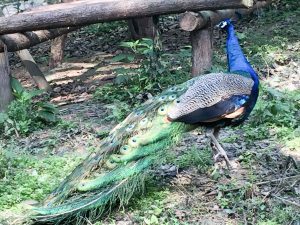 In fact, these slow-moving, sleepy and delightfully lazy creatures tend to do just a couple of activities – strip the bamboo with their claws and teeth to get at the inner stalks, or sleep. An adult panda can eat around 40kg of bamboo a day. 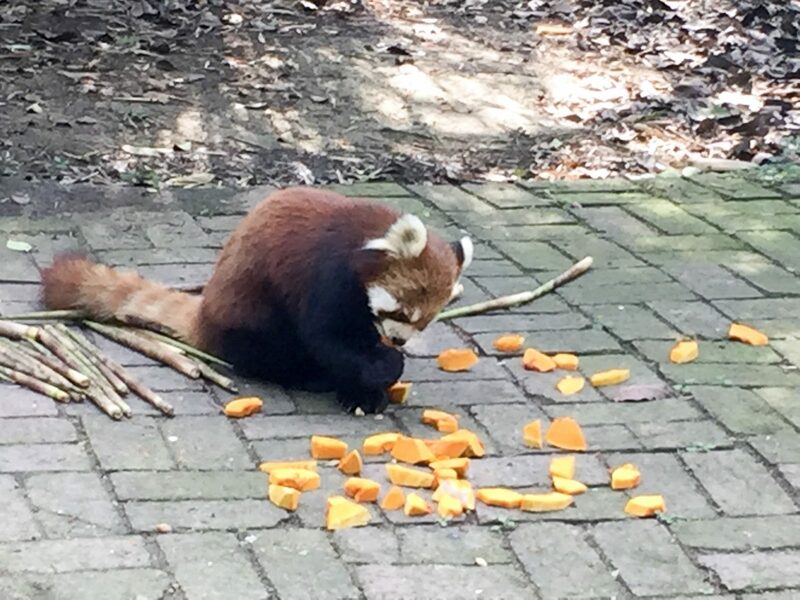 One of the downsides of it being the panda’s favourite snack is that its nutritional value is pretty low. That could explain why their activities revolve around eating, interspersed with catching a few ZZZZ. 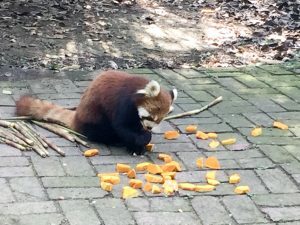 The base occupies around 92 acres and there are plans to increase this to a whopping 500 acres, with a view to eventually releasing some pandas back into the wild. 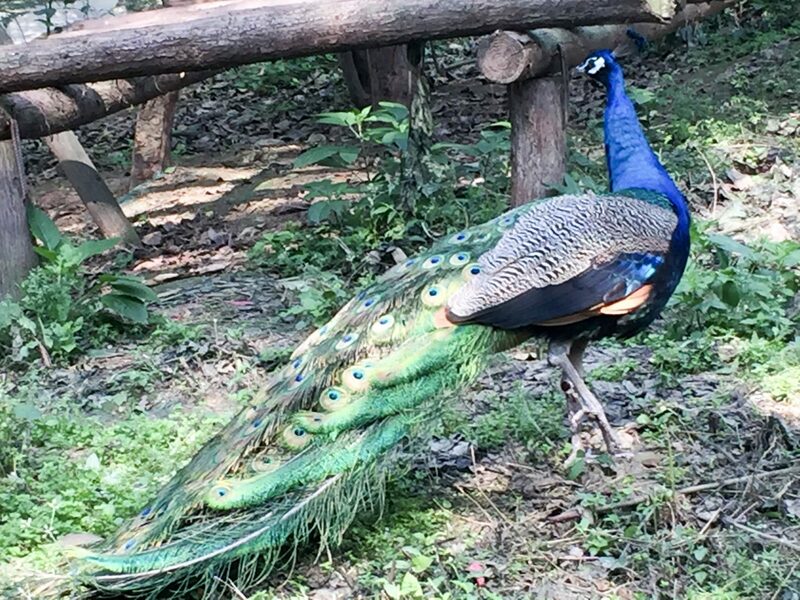 As well as giant pandas, there are red pandas, loads of birds and some strutting peacocks, who are quite frisky. Sadly though, the pandas are far from frisky and that’s one of the main reasons their stocks have plummeted. At this facility, there’s no ability to directly interact with the pandas. If your bucket list desire is to cuddle a cub, the other centre at Dujiangyang is your best option. Prime breeding season (such as it is) for pandas usually results in cubs being born in June and July. Being there in May, there were no recent births (the nursery building was very empty). We booked a tour guide to take us around the facility. Her English name was Shirley and her English was reasonable, although she struggled to converse beyond her well practised spiel. A clean, new car, with a very sedate driver picked us up at our hotel after an early breakfast and we battled the peak-hour traffic to make the trip to the base, on a reasonably sunny, if cool morning. And so we walked, and strolled, around the grounds. There are a lot of stairs, but also a trolley bus that can ferry you around if you have mobility issues. Shirley handled our tickets and recommended a walking trail. 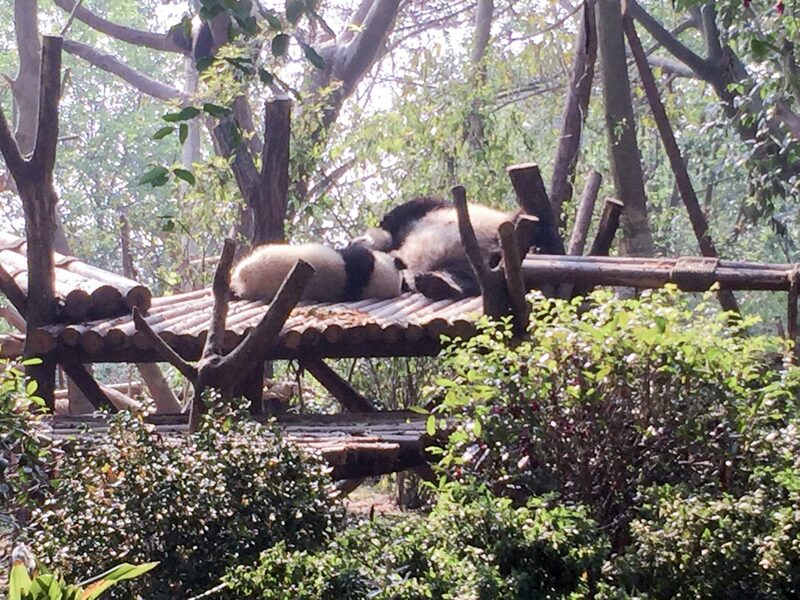 It’s best to go in the mornings because our lovely, lazy pandas are said to be at their most active then. As we wandered around and saw a few pandas still sleeping in the tree boughs, an announcement was made over the public address system – in Chinese of course. 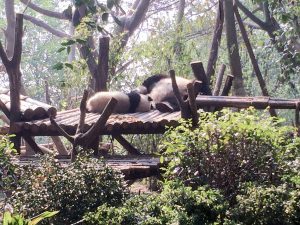 Shirley nodded and ushered us to an open-air pit where a keeper was making a bit of a racket and drove out a group of around six pandas, who bounded on to the timber platform like excited puppies, where bamboo stalks were waiting. Did I mention they were adorable? 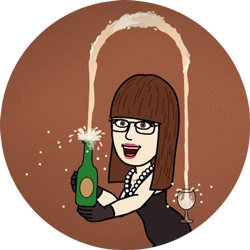 But that was basically that. Once out, they immediately settled and started hoeing into the bamboo. Still, it was great to see so many of them in one place. Another problem for the species is that they tend to be somewhat solitary animals. It takes about an hour to walk around and see all the enclosures. There’s also a museum, with a documentary about preserving the pandas (in English) running on a continuous loop. There are also some kiosks dotted about, decent toilet facilities (western toilets) and a nice lake to sit beside if the weather permits. It’s not really necessary to have a guide here. You can read up in advance and wander at your leisure. If there’s an announcement, follow the movement of the crowds and hopefully you’ll see these delightful bundles being as active as they get. There are public transport options, but I’d always recommend getting a driver, or a taxi at the very least, but it helps a great deal in China if you can speak the language.